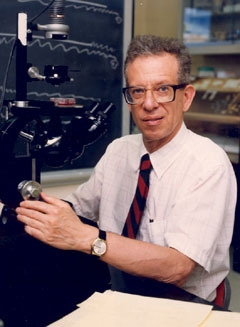 In the early 1960s, American virologist Howard M. Temin theorized that the genetic information in ribonucleic acid (RNA) could copy itself into deoxyribonucleic acid (DNA), which challenged the then-widely-held view that genetic information could only be passed in the other direction, from DNA to RNA. Even as he gathered further evidence, other scientists remained skeptical, but in 1970 Temin proved his own theory by showing that genetic data could flow "backwards" through a particular enzyme (called "reverse transcriptase"). At about the same time, a former colleague of Temin's, David Baltimore, obtained the same results in separate studies at the Salk Institute. Temin was awarded the Nobel Prize for Medicine in 1975, sharing the honor with Baltimore, and with their one-time teacher, Renato Dulbecco. Temin's first scientific paper was published when he was eighteen years old. He performed the first of his studies that led to the Nobel Prize in a basement lab at the University of Wisconsin, which also housed the building's heating pipes and a sump pit. Even after moving to a newer, better-equipped laboratory, Temin stored his Nobel Prize in the bottom drawer of his file cabinet. From his own research and readings, he estimated that 80% of all cancers were caused by environmental pollutants, most prominently cigarette smoking. Though he never smoked, Temin died of lung cancer when he was 59 years old. His brother, Peter Temin, was a widely-respected economist, a professor at the Massachusetts Institute of Technology, and the author of The Fall of the Bell System. Another brother, Michael Temin, taught law at the University of Pennsylvania.